You want to live the healthiest life possible and you realize that to do so, you can’t rely on the same old exercise routine. You need to change it up and adjust your plans as you grow older. It may seem daunting, but the good news is that staying fit can be easier than you think. 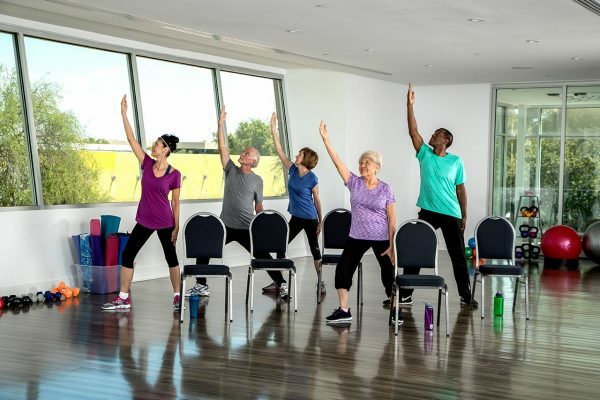 If you are an older adult who likes yoga, strength training or aerobic exercise – or if you are considering such a regimen – Logue suggests a few ways to switch up your routine, so you can continue living a healthy, active lifestyle. Yoga is popular with fitness enthusiasts of all ages, and for older adults, practicing yoga can improve balance, flexibility, mental focus, core strength and breathing efficiency. It can also be a wonderful stress reliever. If you are new to the practice of yoga, or if you feel unsure or unstable during any class, consider using a wall or chair to aid you in your balance for certain poses. Make sure to protect your joints by moving gently into stretches and poses, never forcing your body into any posture. You can regulate your blood pressure with even, continuous breathing. Additionally, be aware that inversions, those poses that place your head below your heart, can cause changes in blood pressure. Finally, while yoga can certainly be practiced alone, taking a class through SilverSneakers is a great way to bond with others during your workout and get expert guidance from a trained instructor. Building muscle mass is a key benefit of strength training, but for older adults there are additional benefits. Strength training, sometimes called resistance training, supports bone health and aids in the prevention of osteoporosis, improves your balance and supports a healthy weight. Regular strength training also can make everyday activities easier. The Centers for Disease Control and Prevention (CDC) recommends that adults of age 65 and older, who are generally fit with no limiting health conditions, should do resistance training exercise on two or more days a week, focusing on all major muscle groups. When beginning an exercise program, the best practice is to start with lighter weights, performing one to two sets of each exercise with 10 to 15 repetitions in each set. To continue to benefit from strength training safely, increase your resistance slowly, always using proper technique to avoid strains and other injuries. You can manage your blood pressure by exhaling during the most challenging part of each exercise. Choosing to work out with a partner or coach can help keep you motivated and make you more aware of your form and alignment, keeping you safer during your workout. Finally, take a break. Allowing a day between strength training workouts helps your muscles recover so you come back to your next routine even stronger. Download the new SilverSneakers GO(TM) app and discover programs to fit your personal activity level. Whether it’s dance or another calorie-burning cardio exercise like cycling or walking, getting your body moving is a fun and healthy way to improve your lifestyle. Cardio exercise has also been shown to improve your coordination, agility and reaction time, as well as help you manage your blood pressure and improve cognitive function. Plus, it’s just flat-out fun, especially if you enroll in a class as a SilverSneakers member. To keep your cardio routine interesting and effective, pay attention to the impact that some types of exercise can have on your joints. Walking, cycling and water exercise are all efficient ways to get a great workout while being gentle on your joints. And, with social isolation affecting as many as 43 percent of older adults, asking a friend to join you is a great way to stay motivated, connect with others and enjoy life. Improvements to your regular exercise routine will support you in your goal of living a healthy life, but you can take the next step with the support of a program that includes classes, digital tools and workouts designed with seniors in mind. Medicare open enrollment takes place from Oct. 15 to Dec. 7, so as you review your plan options, look for a health plan that offers SilverSneakers. Members have access to more than 15,000 fitness locations and community organizations across the country, so don’t delay. No matter where you live, a better, healthier you is waiting to be discovered. To learn more about SilverSneakers, visit www.silversneakers.com.